CHARLOTTESVILLE, VA. — A fully-packed, specially-chartered city bus made its way to the Charlottesville Circuit Courthouse yesterday afternoon. Its passengers weren't just city residents but victims of the murderous car ramming that occurred during the August 12, far-right, "Unite the Right" rally and their family members. The group was present to hear Commonwealth attorneys upgrade the charges from second to first degree murder against James Alex Fields, Jr., the young neo-Nazi accused of being behind the wheel. Fields faces eight other felony counts. To make the case for the upgraded charge, which the court certified, the Commonwealth presented disturbing new video evidence showing Fields' Dodge Challenger before, during, and after the event running down a group of counter-protestors, killing 32-year-old Heather Heyer and injuring as many as 36. Footage from a fixed angle security camera in downtown Charlottesville left little doubt about premeditation on the part of Fields. Witness Steven Young, a Charlottesville Police Department (CPD) detective, narrated the video showing Fields' gray sports car driving with the flow of traffic, then slowly backing up and finally accelerating at a high speed in the direction of the crowd. The Commonwealth also presented additional aerial footage from the Virginia State Police helicopter that captured the attack and followed Fields as he fled the scene only to surrender a little over a mile away. Blood and “flesh matter” were visible in crime scene photos of the vehicle and a water bottle from one of the victims was still lodged between the hood and the windshield. Detective Young testified that the holes in the rear window of Fields’ car came after and in reaction to the attack, further dispelling claims that Fields might have acted in self-defense. 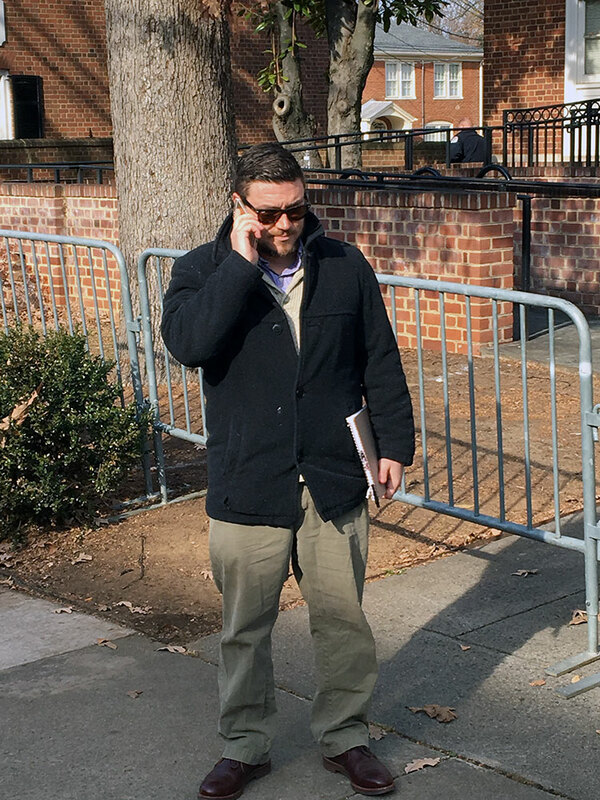 Fields’ attorney focused on the remorse Fields expressed while in custody and started to paint a picture of a loner, unconnected to any of the groups participating at the rally including the neo-Nazi group he was photographed with — Vanguard America. Fields’ attorney said that her client attended the rally to see a certain speaker but did not specify which one. Adding insult to the proceedings was the presence of the rally’s organizer, white nationalist Jason Kessler. Kessler appeared at the courthouse early and stayed through the full day of hearings which also included those for Klansman Richard Preston, charged with unlawful discharge of a weapon, and Jacob Scott Goodwin and Alex Michael Ramos, accused of malicious wounding in the beating of De’Andre Harris. Earlier in the year, Ramos was seen at an anti-Muslim rally with the Georgia-based antigovernment extremist group known as the III% Security Force. White nationalist Jason Kessler, organizer of the August "Unite the Right" rally, was present for the full day of hearings. Outside, Kessler was hounded by locals and at one point verbally upbraided the police for allegedly violating his First Amendment rights. Kessler refused comment to the SPLC. For the victims, the Fields hearing was a mix of relived trauma and relief. Members of the victims’ group cried out in shock when the security video played. Marcus Martin, who suffered a broken leg in the attack, abruptly left the courtroom along with two others. Grand jury proceedings for Fields, Preston, Goodwin and Ramos are scheduled for Monday, December 18. "No More Hate." 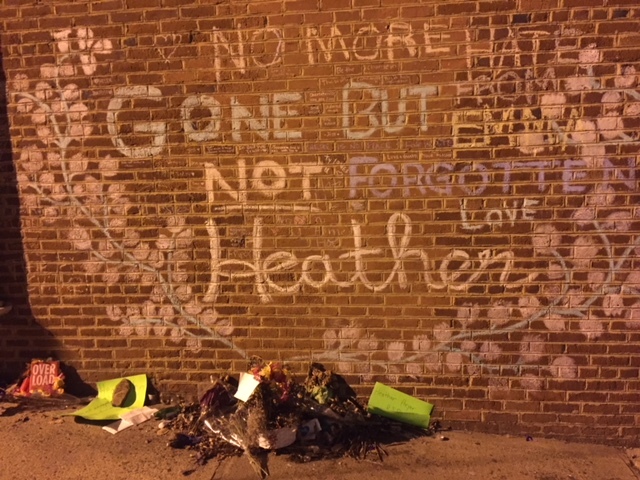 A makeshift memorial for Heather Heyer near the corner of 4th Street and Water Street in Charlottesville.